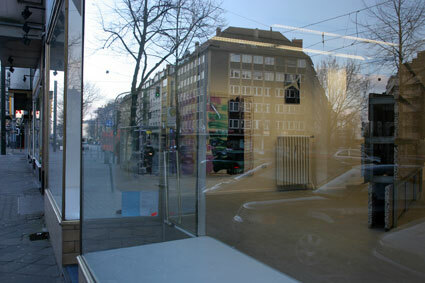 ESTEMP is an artists’ space for projects and exhibitions in Düsseldorf, initiated by the artist Ellen Slegers. The space is in the backyard of brick apartment houses from the early 20th century, located on Hüttenstraße No 63 in the district of Friedrichstadt. Since the end of 2005 ESTEMP organizes thematic group shows. The exhibits vary from painting to conceptual art. Previous exhibitions showed positions of abstract paintings as well as artists working with personal references and architectural concepts. The participating artists work with various types of media: painting, photography, sculpture, installation, video, music and sound. After a period of using the space as studios and after a renovation of the rooms, ESTEMP starts again its exhibition activities in 2009/ 2010. In the future, the range of exhibits will be enlarged by inviting artists as curators; thereby ESTEMP likes to take part in the local discourse of contemporary art positions in and outside the artists’ community. In addition, a publication about previous exhibitions with essays of art historians and artists will be published. ESTEMP´s approach in the future is to realize activities outside of Düsseldorf as well as an exchange with further national and international artists spaces.